We offer a variety of opportunities for training – in homes, classrooms, outdoors, live, online, always in community. Let us know if you’re interested in learning the Vineyard 5-step prayer model! Ladies, we’d like to invite you to join us on Saturday, date-tba for our biannual Liberty Vineyard daytime women’s prayer retreat @ 9am-4pm ($10 includes lunch). As in previous prayer retreats we’ve done, we want to grow in prayer and listening to what the Lord is speaking to us, using all manner of ways in which the Lord has endowed us . . . space, time, creativity, senses, gifts, gleanings from the body of Christ . . . we will begin at 9am and end at 4pm, and you are welcome to join us for all or part of it, as your schedule allows. Let us know if you’d like to be included on our email list to receive periodic invitations to women’s prayer retreats and Bible studies. 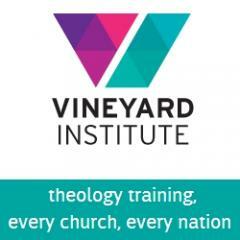 Vineyard Institute at Liberty Vineyard will start back in early 2019! We meet on Friday evenings @ 8:00—9:30pm (Sculley home). Each class is $150 and is comparable to theological training at a Bible college. Instructors are adjunct faculty from all over the world under the leadership of Dr. Derek Morphew, our Academic Dean. Please check back soon for specific information on our next class. Click here for more information! The 2019 Society of Vineyard Scholars conference will be held on date tba, 2019 at location tba. Let us know if you’d like more information or if you’d like to support one of our delegates, some of whom have been presenters and / or moderators. 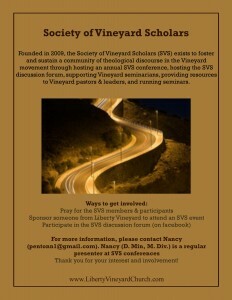 Several of us have completed two years of training with the Vineyard School of Spiritual Direction. We offer spiritual direction (by appointment). Vineyard Heroic Leadership Institute exists to serve the Vineyard movement and to create a path for the young leaders. HLI is committed to raising a generation of risk-taking leaders who’s identity is rooted in the Fathers love. An army is rising who are ready to join in His redemptive mission for humanity in each and every community around the globe! 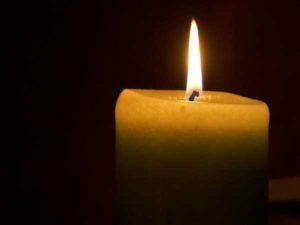 C – Christ is all! N – Never give up!